Eulogy... and a tribute to analog influences. DEMLER - Donald F. April 20, 2009. Son of the late John and Josephine Mosca Demler; brother of the late John (late Irene) Demler; uncle of... Michael (Sandrine) Demler... ; also survived by several (great) nieces and nephews. No wake or funeral services will be held. "No wake or funeral services will be held"? I won't go into all the reasons that is the case, but my uncle deserves much better than that, so excuse me if I appear to go a bit off topic here. If you read on you may appreciate that there is actually a great deal of relevance to my theme of "The World is Analog". You see, while I truly value the connections I have made through virtual social networks, it's important to not let the digital cloud cause us to forget our analog roots. I mean that both metaphorically and literally. 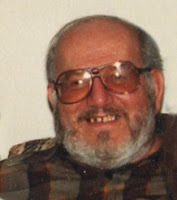 My Uncle Don was the last connection I had to the world from whence I came, my personal "ground" connection if you will. He, along with my dad, had a great influence on my analog nature so this is a tribute to him. Until I was about ten years old, my family lived at 15 ½ Garner Ave on the West Side of Buffalo NY. Ultimately there were six of us in that tiny cottage located behind the main house, where my grandmother and uncle lived in a first-floor flat. (Hence our half-address). My uncle seemed to come and go during those years, but I remember always looking forward to the times when he was around. My dad and uncle influenced me in some similar ways, but they were also very different. You could call uncle Don a free spirit and fiercely independent, some even thought of him as a loner. Where my dad always wanted kids and a family uncle Don never married, and he always went his own way. That may have made him difficult to get close to for those who require conformity to their personal norms in their associations, rather than appreciating the unique qualities of each individual. But behind the loner persona was a man of many passions, who bonded selectively but strongly to the people and places that attracted his interest. Now that sounds like a lot of analog engineers I know! I'm sure that those qualities led to our bond as well. As a young man, uncle Don had been in the Air Force. When I visited him last December, he shared stories of his military job - which was spying on Russian radio transmissions from a remote outpost in the Aleutian Islands. In those days they would be assigned a set of frequencies which they were to manually scan for Morse Code chatter. My uncle was trained to rapidly transcribe the dots and dashes into alphanumeric characters, without ever understanding a word of Russian himself. His assignments to the listening post meant being away from civilization for months at a time. One could imagine how you could either go crazy from the experience, or get used to being alone. However it may have influenced his later life, the isolated existence in the Aleutians also stimulated his interest in shortwave radio. 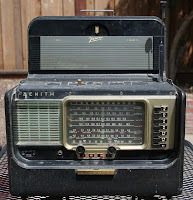 This was an interest that uncle Don passed on to me in the form of a Zenith Transoceanic Shortwave Radio, which you can see pictured here. He gave me the old tube set from the fifties when he acquired a more modern solid-state shortwave radio. Mine is somewhat beat up now from my own travels, and hasn't worked in a long time, but now I am motivated to see if I can't get it fixed. The Transoceanic was one of my first pieces of electronic equipment, and you can just see the analog influence looking at it. I spent many summer evenings DX-ing, scanning the AM band and keeping a log of the furthest transmission I could receive from my home in Buffalo. (WHO in Des Moines, Iowa if I remember right, approximately 850 miles away). I would also search the shortwave bands for Voice of America broadcasts, listen for the chime that indicated that the Russian propaganda station was on the air, or even listen (in Spanish) to Fidel Castro's bombastic speeches from Cuba. Those could go on for hours! I could listen to the police band (no.. not the one with Sting), or do some spying myself since mobile communications in those days meant a radio in your car, long before cell phones came along. I'll never forget the time I happened upon a conversation between a man and a woman who were apparently having an affair. The woman grew nervous that the man was calling her over the radio. Could someone be listening and discover them, she asked? The man responded, "well if anyone is listening... I'll kill them". It may seem crazy, but growing up in a neighborhood where we were no strangers to mafioso hits, that did not sound like an idle threat... I was actually frightened! Jazz is another passion that my uncle and my dad passed on to me, though my dad was more interested in big band. I, as was my uncle, am more inclined to listen to instrumentalists and trios or quartets. 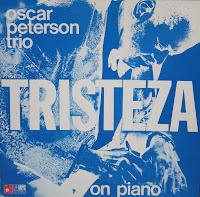 Oscar Peterson was one of his favorites, but he also personally connected with the local jazz scene in Buffalo, and knew guys from Spyro Gyra (which got its start there), and Bobby Militello - a west side "cat " (as uncle Don would say) who has played with Dave Brubeck recently. (If you like jazz, I highly recommend London Flat, London Sharp). I was fortunate to bring back as many old LPs as I could carry in my suitcase in December. He wanted me to take them all, but I just couldn't bring myself to do it then. Now I worry for what will become of them. Vinyl LPs... another analog influence. The first time that I recall listening to a stereo was my uncle's, though my dad had TV consoles that he played records on. My uncle even built a pair of his own speakers, that I can remember listening to to this day. That must be where my audiophile interests began. I recall that he worked for a time wiring up fire trucks and ambulances, adding the lights and sirens to the vehicles. That, along with with my dad's sideline doing TV repair, influenced my early interest in electronics. We always had electronic parts around the house, and I would throw stuff together just to see what worked (or more often, what didn't). I was lucky that I didn't electrocute myself. One talent that I wish I had inherited but did not, is my uncle Don's ability to paint. As an amateur artist, he loved to paint scenes of nature and animals - especially birds and bears. He could tell you the species of any type of duck. I am fortunate to have a few of his paintings. His passion for nature led him to buy property in the small Western New York town of Alabama, where he kept a camper next to the nature preserve. He loved to tell me about the deer that inhabited the property. Uncle Don was loyal to a variety of "drinking establishments", such as the Alabama Hotel. This provided an extended family to him, sort of like Norm in Cheers. After I graduated from college and moved away from Buffalo, we would usually hookup during my visits at "Nootzies". Now I have no idea how to really spell that, since it was my uncle's nickname for Nuchereno's, the late great hangout that was a longtime fixture in the Riverside neighborhood where my parents grew up. But that was real social networking! You could score some Sabres tickets there, if Nuchereno wasn't using them or hadn't sold them to someone else. Or, you could just have a few drinks and a great beef on weck! If you've read this far, I hope that you are prompted to recall some of your own influences. They are to be cherished and remembered, since none of us get here on our own. Don't forget to make some of your own as well. Life is to be lived analog, digital is just an abstraction. Rest in peace Uncle Don. My condolences. You wrote a heartfelt eulogy and I'm sure your uncle would be proud. Be sure to check out www.google.com today: the Google logo is in Morse code! Seems very appropriate. And thanks for your pointer to the Google Morse code! I had not seen that. It is very appropriate, since apparently today is Samuel Morse's birthday! It's clear that you loved your Uncle very much and that the two of you had a special bond. It's a shame we often don't realize what we have until it's gone. I'm glad you did. Your writings are really touching, interesting. I can feel the passion you put in your story and your analog nature. Thank you for sharing it.